This is the first show of Queen's second North American tour. The band had flown to New York on January 31 to rehearse for a few days at the Beacon Theater. The setlist essentially remains the same as it had been in Europe, with Seven Seas Of Rhye being dropped on many nights, probably because it wasn't a hit on this side of the Atlantic. Around this time, the band would usually do two or three radio interviews during the day before a show. Roger Taylor later recalled how monotonous this was, as they basically had to give the same interview every day for two months. Roger also revealed how he would be nursing hangovers during many of these radio spots, which in hindsight is really no surprise, as Queen's partying reputation would soon become legendary. Also around this time, John Deacon was quoted as saying: "The March Of The Black Queen is long, a six minute track, and we spent ages and ages rehearsing this one. Not very easy at all, I can assure you!" 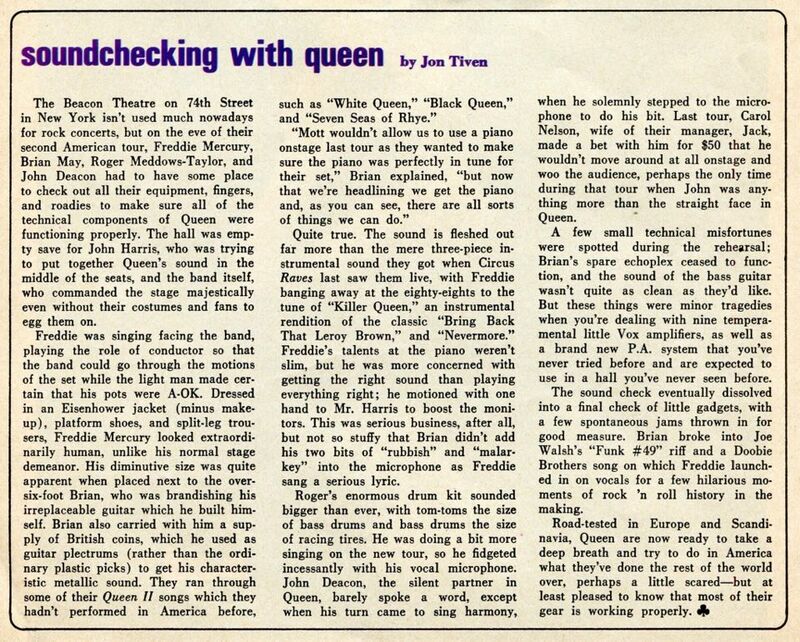 This revealing article from Circus magazine chronicling their rehearsals says they even tried out Nevermore. Brian May states how they couldn't incorporate the piano into their act on their previous US jaunt, because Mott The Hoople wouldn't let them (which is pretty standard fare for an opening act, then and now).